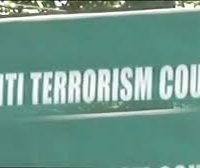 ISLAMABAD: An Anti-Terrorism Court (ATC) of Islamabad on Tuesday issued arrest warrants for Pakistan Tehreek-e-Insaf (PTI) Chairman Imran Khan and Pakistan Awami Tehreek (PAT) chief Tahirul Qadri in a case regarding the attack on PTV building and torture of the-then Senior Superintendent of Police, Islamabad, Asmatullah Junejo, during their sit-ins in 2014. The court also sought detail of the properties owned by the two accused in Mianwali and Lahore to start a process for their confiscation due to their continuous non-appearance in court proceedings. ATC Judge Shahrukh Arjamand heard the case against Imran Khan and Dr Tahirul Qadri for their alleged involvement in the attack on the PTV building and torture on SSP Asmatullah Junejo. All the witnesses including SSP Junejo had testified in the case. The court observed that the process to confiscate the properties of the two accused would be started once the details were produced. It may be mentioned that during the last hearing, the chief commissioner Islamabad had submitted the property details owned by Imran Khan in Islamabad with the court.The two doctors, who had examined Asmatullah Junejo after the torture, had also recorded their statements. The court directed the police to take concrete measures to arrest Imran Khan and Tahirul Qadri.